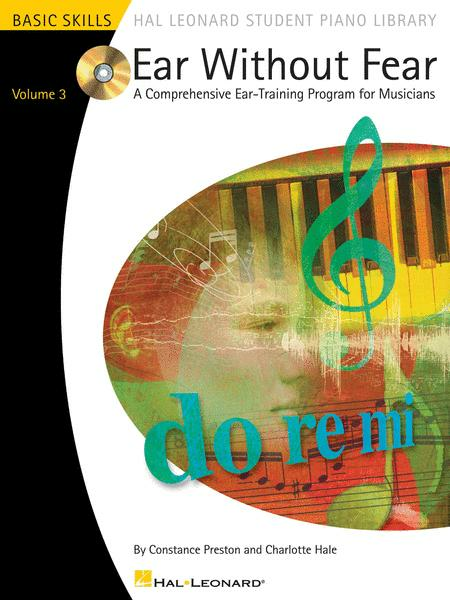 Comprehensive Ear-Training Exercises for Musicians Volume 3. Educational Piano Library. Instruction. Softcover with CD. 64 pages. Published by Hal Leonard (HL.296552). ISBN 0634088017. 9x12 inches. Constance Preston and Charlotte Hale Book/CD Packs. Ear Without Fear is an innovative program aimed at building a foundation for reading music and developing the skills to perform it accurately. The authors have carefully chosen and organized the materials in this book to make the learning process as accessible to students as possible. The workbook and CDs are integrated to provide several learning approaches: aural, visual, and practical. The following concepts are introduced in level 3: major and natural minor scales; the keys of C, G, F, and D major; the keys of A, E, D, and B minor; the alto and tenor clefs; the order of sharps and flats; the major and minor 3rd and the perfect 5th; major and minor triads; demonstrations, exercises and dictations covering these areas; and more.